Add Weather & Graffiti Protection (POF)--Only $19.95! Warning No Dumping Violators Will Be Prosecuted Sign - 24x24 - Reflective Rust-Free Heavy Gauge Aluminum Property Signs with Anti-weather and Anti-graffiti protection Available. This popular Warning No Dumping Sign is also available in 18x18 size. DOUBLE the working life of your Dumpster Under Video Surveillance Signs by adding 3M Protective Overlay Film (POF)! 3M’s high-tech POF protects sign faces against fading caused by the sun and harsh weather—and makes graffiti and sticker defacement damage easy to clear away without harsh abrasives. Illegal dumping, open dumping, or "midnight dumping" is whenever waste is disposed of anywhere other than a permitted landfill or waste facility. Call it whatever you want, but it is not only against the law and a major expense for property owners and managers, it also poses a direct threat to human health and damages our shared environment. 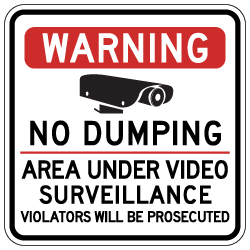 Posting private property with No Dumping signs that warn of your willingness to prosecute violators is essential to maintaining control of your property and stopping illegal dumping before it happens. Using No Dumping Violators Will Be Prosecuted signs not only protects your private property, it protects the property and well-being of your tenants, visitors, and neighbors.